why are books always better than movies? Friday night, we went to see “World War Z” in the theater. I hadn’t read the novel ahead of time, but even though the movie isn’t reported to follow the book closely at all I still left the theater feeling pretty sure that I would have preferred Max Brooks’ version. I’m beginning to wonder if I should just give up on watching movies that are based on books. When I was in Ireland on my IRP fellowship, I interviewed a professional storyteller who explained that movies and television are passive entertainment?there’s no requirement for the audience to do anything other than sit back and watch. Certainly some movies challenge watchers to keep track and keep up, but for the most part visual media isn’t nearly as engaging as reading or even listening to a story. When you’re not given the option of choosing the face, voice, and other mannerisms of a character, you have no choice other than seeing Vivien Leigh as Scarlet O’Hara. Even if you do go back and read the book later, her face swims immediately to mind at every mention of the heroine. But reading demands more. When you dive into the pages of a story, it’s up to you to choose precisely what shade of green the hero’s eyes are or how gruff or smooth his voice is. You’re the one who imagines the pungent odor of the rough-and-tumble bar room where the dirty deal goes down, or the chill of the early spring breeze that lifts the ribbons in the little girl’s hair. It’s an intimate partnership between author and reader to bring every aspect of the story to life. Books?and even oral stories?engage the imagination in a way the screen just can’t. Granted, this may not be true across the board; I’d seen “Gone with the Wind” so many times growing up that by the time I finally got around to reading it, I found it difficult to compare the two. However . . . There was a lot I liked in that book, too, that didn’t translate to the screen. Good books are multidimensional. There’s more than just the main plot to keep the reader turning the pages. There are subplots, nuances, whole worlds of internal dialogue, and layers upon layers that very often simply cannot be captured by even the highest definition moving picture and surround sound. I’m sure there must be some screen adaptation (movie or television) that I’ve liked better than the book on which it was based, but right now nothing comes to mind. Some movies come quite close to equalling or even surpassing their text origins? ?The Green Mile” and “Contact,” for example?but others are such a far cry from what they could have been that I end up feeling let down no matter the quality of the movie version. What books have you preferred to the screen version, or vice versa? 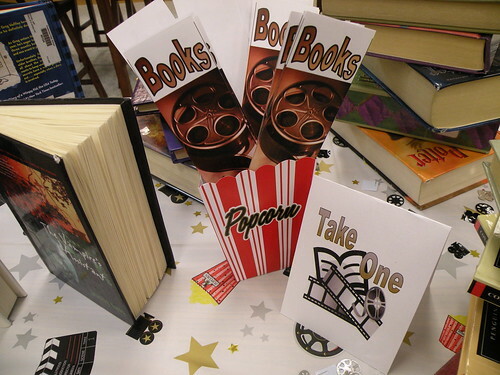 Creative Commons photo: Movies and Books Display, March 2010 by theunquietlibrary. Harry Potter. There is so much in the books that doesn’t translate. On the other hand, The Princess Bride. They are very different, and each is wonderful in its own way. As much as I enjoyed Peter Jackson’s adaptation of Lord of the Rings, I still prefer the novel. Double true either adaptation of Dune.